TFD » Blog » Posts tagged "winter wonderland themed decorating"
How much have you been enjoying the winter season? Hopefully plenty! At Todich Floral Design, we’re enjoying the loveliest aspects of winter. We love it for the holiday season, Christmas and New Years, and the magical, snowy transformation of the outside world. Because if you’re not in hurry, who doesn’t love an evening snowbound, at home, wrapped in blankets, fire roaring, hot toddy in hand? Now, check out some ways to bring the winter theme indoors, using Todich Floral Designs winter wonderland decorating ideas, while still keeping the cold outside. This is especially kid-friendly but also great fun for adults who want to take a hands-on approach to the winter decorating theme. Seek out some winter wonderland templates and some heavy white paper—or for the more artistically inclined, try sketching shapes yourself in pencil—then cut the outlines out with a scissors and hang them up with string. Snowflakes, crystal shapes, wintery branches, reindeer, snowmen and evergreens are great designs to start with. White on white flower arrangements — Small, simply and intimate flower arrangements are a wonderful way to bring the beauty and theme of winter inside your home. 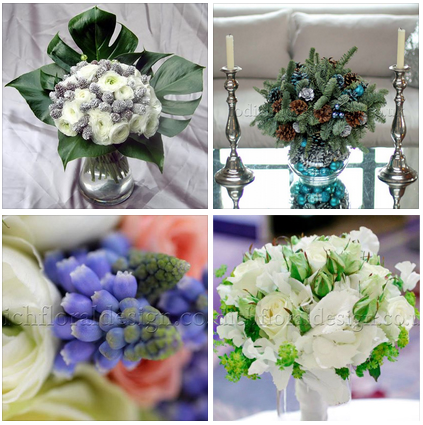 Try out fresh white roses, peonies, orchids or tu- lips, in glass vases or flowerpot arrangements. 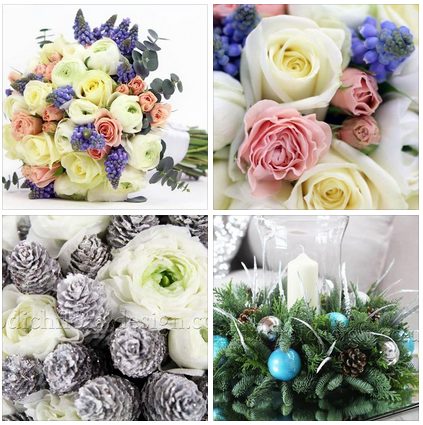 Christmas bouquets and fresh flowers for flair can brighten up kitchens, di- ning room tables and living rooms. A potted poinsettia plant, lilies and berries flower arra- ngements, or daises on a windowsill are a pictu- resque view from the armchair as well as a wonderfully welcoming sight to visitors. Don’t forget about the other aspect of the 2015 winter season— the holidays! Evergreens and houseplants are great holiday decorating ideas. Christmas winter wonderland decorating ideas like small poinsettia plants, miniature evergreens, even ferns, all add an enlivening contrast to the stark white palette that you’ll find outside. If you actually don’t have enough white and possess a do-it-yourself attitude, then try applying white paint to thin tree branches for indoor display. Just make sure you remember to leave them outside long enough to dry! Also consider traditional Christmas pine wreaths or, a fancier spin, baskets that combine pinecones, cinnamon sticks, ornaments and even fresh fruits. Don’t be surprised if you find these splashes of green leave you with an elevated mood and in the best of holiday spirits! Put Your Winter Gear on Display. Having a Winter Wonderland Party? Instead of cleaning up all your mess, you might consider featuring it instead. Take a pair of laced ice skates, the red sled or old toboggan, and put them outside by the door or on the patio for a fine winter deco- rating theme display. No home speaks a welcome or has winter wonderland invitations like a brightly lit home. Crystal lights, candlelight, Christmas lights and a glowing fire are several ways to add warmth, seasonal appeal and a cozy vibe for you, your family and holiday guests.